Perhaps a more revealing statement came from CNBC’s Steve Liesman who said on Friday we are “in a completely different regime“. To his credit, Paul Richards of Medley Advisors called it on Friday morning on BTV. He said China cannot afford another year of this and said “get ready for a bad set of numbers on Sunday“. He added “I think they are close to a deal” and said the fact that Liu He, China’s Vice Premier, is coming on January 30-31 is incredibly positive. Holger Zschaepitz‏@Schuldensuehner – #China is said to offer path to eliminate US trade imbalance,BBG reports. Now look at the 2-day action in the Dow beginning from the WSJ “news” about delay in China tariffs that was denied quickly. Now it is obvious that the President preferred this news to come from China rather than from the Trump Administration. In any case, the Dow rallied by 500 points from 24.200 on Thursday around 2:40 to 24,706 at Friday’s close. Donald J. Trump‏Verified account @realDonaldTrump – I will be making a major announcement concerning the Humanitarian Crisis on our Southern Border, and the Shutdown, tomorrow afternoon at 3 P.M., live from the @WhiteHouse. So perhaps the third obstacle would also be overcome soon. Lawrence McDonald‏@Convertbond – It’s been nearly 16 years since positive momentum has been this strong, over 90% stocks are above their 20 day moving average. Great call by the @BearTrapsReport team. December Bulls! Last happened in April ’09 (hit 6 in a row then). Feb ’96 and Jan ’76 hit 4 in a row before that. This type of persistent strength is quite rare. 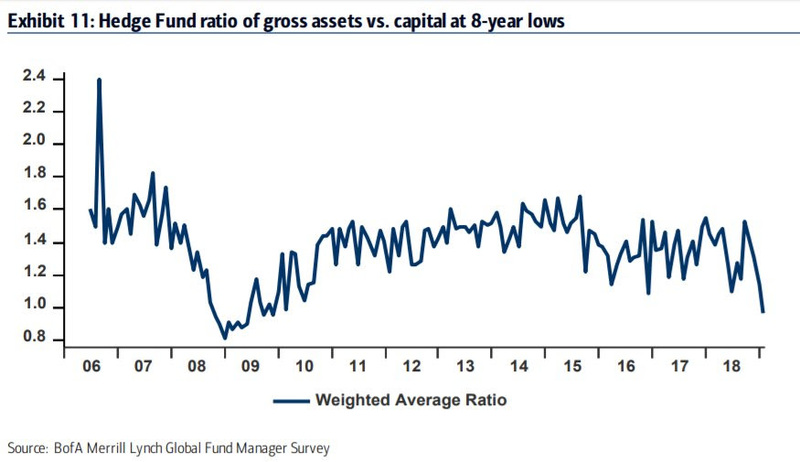 How much cash are Hedge Funds carrying? But what about earnings? Well, the stock market answered the question by taking the financials way higher after mediocre earnings. Goldman Sachs was up 15%, Bank of America was up 13% and Citi was up 11%. Kudos to @DougKass for identifying this sector as an overweight for 2019 and choosing, if we recall correctly, Goldman Sachs as his top big cap stock for 2019. Most of our short-term indicators remain on buy signals, and thus we remain short-term bullish and longer-term bearish. That is a balancing act that may be hard to maintain. Right now, there seem to be a lot of bears on TV talking about “W” bottoms, retests, and resumption of the bear market. 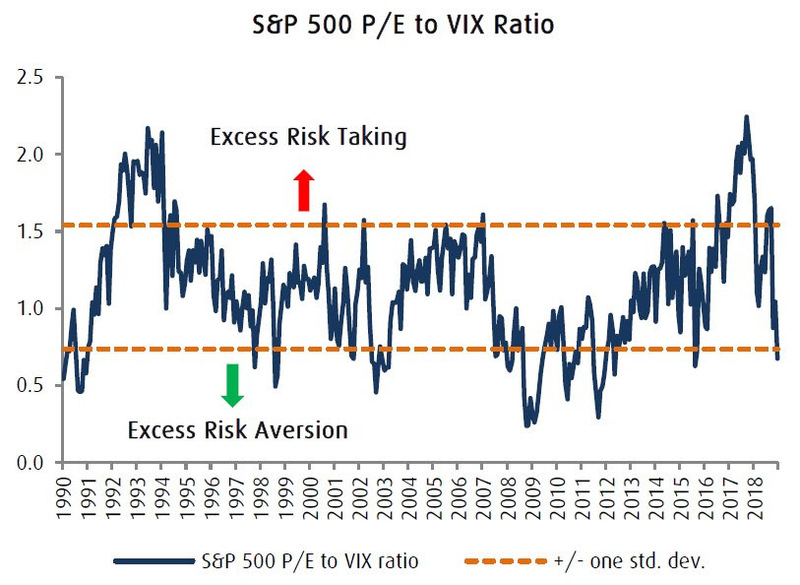 I would think that the current rally has to carry far enough so that a great number of these bears will have to relinquish their position before the market can turn lower again. But isn’t there one obstacle remaining? 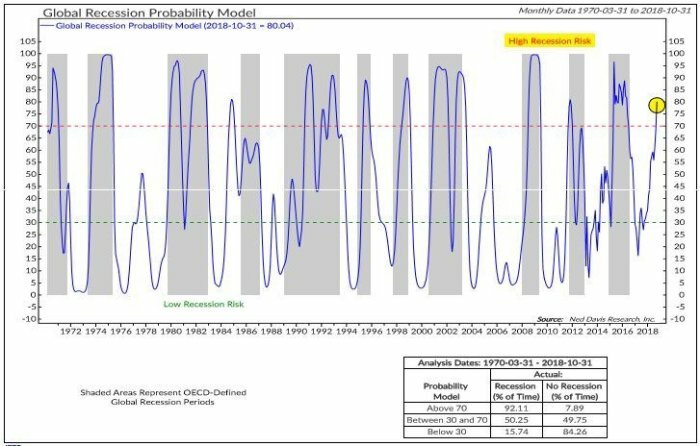 David Rosenberg‏ @EconguyRosie Jan 16 – One reason to view the renewed risk-on rally as a technical bounce rather than fundamental is because we’re staring at a global recession. It’s not just me – the crew at Consensus Economics (seemingly out of consensus) sees sub-3% world GDP growth for the first time since ’09. We are finally back to normal this week. The inversion between 1-year yield and 2-7 year yields has ended. Interestingly, the inversion did not end with the 1-year yield collapsing because of Fed-is-done expectations. The 1-year yield actually rose by almost 2 bps this week. But the rest of the curve rose much higher in yield to keep up with the stock rally. Is the rate market saying Yellen was too hasty in pronouncing the end of rate hikes in this cycle? Gold was down this week with a rally in the Dollar. You have to wonder how the Dollar does not go up big with Europe in semi-recessionary trouble, with China pouring in fiscal stimulus to avoid a slowdown & the rest of the world in not so good to bad shape. So why did a smart investor like Sam Zell buy Gold for the first time in his life? Listen to him below. Zell also said he is “pretty comfortable that oil price is not going down“. And unlike Gold, Oil rallied 4% this week with OIH & XLE up 4% & 3% resp. Not so long ago, we heard talk on FinTV about India becoming a second China for Apple. We could not understand it because Apple could at best exploit a small niche market in India because of the price of iPhone. You just can’t get a big share in India without having inexpensive but good products. Now Apple is planning to launch inexpensive phones in India, we hear. That brings us to Netflix and the talk we hear about the potential penetration of Netflix in India. We have one word of warning – HotStar. Forget India for a moment. Hotstar is making huge inroads into the Indian-American market. This month, Star Network, the old Fox & the soon to be Disney network, went off Spectrum & other Cable TV companies in America AND chose Hotstar as its SOLE content distribution company in America. The introductory cost for Hotstar was $60.00 per year discounted via a $50 Amazon gift certificate. Regular pricing is now $99.99 annually for both Sports & Entertainment & only $39.99 annually for only entertainment in virtually all major Indian languages. Remember the commentary by CNBC’s David Faber & Jim Cramer that Disney bought Fox network to a large extent for India’s Star Network and that too for Star’s TV deal for Indian Cricket. Now both Indian Cricket & Star network entertainment will only be available in America via Hotstar. This leaves Netflix with the costly responsibility to develop original content in multiple Indian languages. Does that mean Netflix is destined to remain only an expensive niche player in India? Like Apple? And oh yes, Amazon Prime Video is already a huge competitor in India with releases of new Indian films, both Bollywood national films & regional language films. That brings us to the core business of Amazon and of Walmart-Flipkart. These two giants have two big weaknesses in India. Everyone knows how Walmart devastated small retailers & family store owners through out much of America. Then came Amazon to devastate physical store based retailers. The only way to compete against Amazon seems to be to combine a smaller scale physical stores with powerful e-commerce. Now jump to India and notice the huge number of small shopkeepers & store owners that dominate retail sales. Yes, these may not be efficient and many people might prefer Amazon & Walmart-Flipkart. But the small shop keepers have a huge lobby and this lobby is a big part of BJP’s base. And now they are in revolt. So it should surprise no one that the Indian Government is finalizing policies that will take away some of Amazon-Flipkart’s advantages and make the shop keeper lobby more competitive. Then you have the big national security issue. Both Amazon & Walmart, along with MasterCard & Visa, keep & process Indian data outside India, a big security issue for the Indian Government. Combine these two and what do you have? An entry point for India’s biggest barracuda, Reliance & its CEO, Mukesh Ambani. This Friday, Ambani announced a new commerce platform, a partnership between Reliance retail subsidiary and its Jio telecom unit. Ambani was the last to enter India’s competitive cell phone business. And he virtually destroyed the pricing model as he entered. By pricing his data services very cheaply on his high speed 4G network, Jio has already got 250 million subscribers. This week’s results showed a 51% increase in revenue to Rs, 104 billion. This did not come cheap. Reliance has reportedly invested $30 billion in the telecom business. Ambani is launching his “commerce platform” in Gujarat, the pro-business state of shop keepers & tradespeople. And his venture, he said, would “empower and enrich our 1.2m small retailers and shopkeepers” in the state. The fight between Amazon-Walmart and Reliance & the network of millions of shop keepers will be a cut throat bruising battle between proven cost & price cutters. We think all three will be bloodied and the ones who can bleed the most will survive. We do think, at the very least, both Amazon & Walmart will have to invest to keep & process Indian data within India and that, in itself, will add to their investment & costs. Reliance already does this for 250 million of its Jio customers. Can Reliance use its huge customer base to offer retail through its Jio phones and use the Jio revenue to undercut Amazon & Walmart? Can Reliance launch AWS type services to the huge network of shop keepers & store owners and leverage that to undercut Amazon & Walmart-Flipkart in price? Can this base be used to offer buy online & pick up at your neighborhood store as Walmart does in America? We don’t know how this will play out but watching this fight will be a lot of fun. Who among FANGs is immune to intense price competition in India? F & G – Facebook & Google. So is it worth the cost & effort to get a strong share of the Indian market? And what about upward migration of Indian population? Arun Jaitley‏Verified account@arunjaitley – The McKinsey Institute reports that the size of India’s middle-class is growing very fast from 14% in 2005 to 29% in 2015 & by 2025 it would be 44%. The reality is you just cannot be a global player without a big footprint in India. Paul Farhi‏Verified account @farhip – This beautiful peregrine landed outside our building. 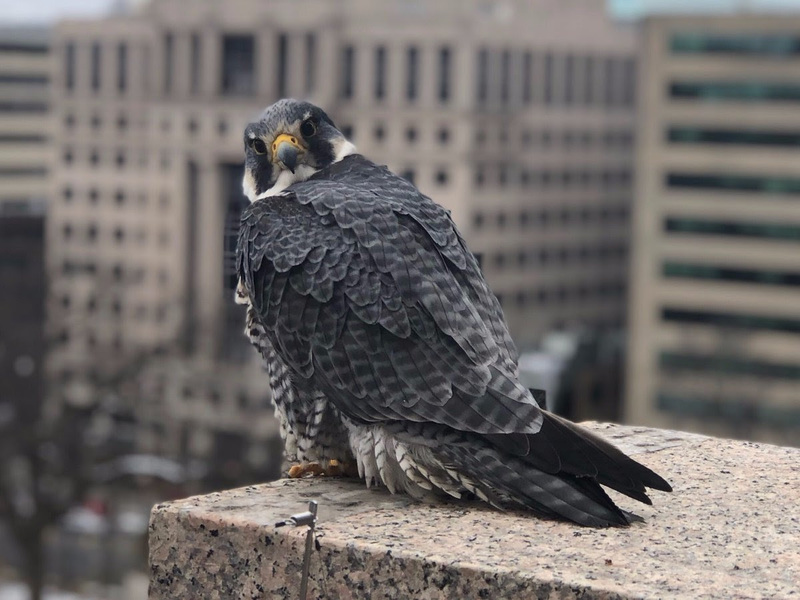 Birds of prey in downtown D.C.